Banking on the skills of our qualified team of professionals, we are instrumental in offering supreme quality range of Aluminium Cold Rolled Sheet. We Are supplier of ss cr sheet. Application: Lamination, Pouches, Food/Confectionery etc. Virgo's cold rolled sheets are produces as per the international standards for tight thickness, tolerance, flatness and dimensional accuracy to be used in both commercial and general engineering applications. The company is a reputed Manufacturer and Supplier of Aluminium Cold Rolled Sheets. We provide a variety of quality Aluminium Cold Rolled Sheets as per the requirement. Our Aluminium Cold Rolled Sheets are of perfect alloy & temper & suitable for its further applications. 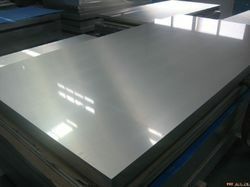 We are offering high-end quality of Aluminum Cold Rolled Sheet to our clients. We fabricate this machine following set industry guidelines, which are further tested on various quality parameters before the final delivery. These are available at market leading prices.